Have Environmentalists/EPA Triggered Electric Power Outages To 3 Million Americans? As many people fall down in the sweltering heat, because of the loss of power to air conditioners, there are others jumping up and down, because the excessively hot weather seems be to punishing those naughty Americans, known around the world to use more than their "fair share" of energy. Coupled with the severe storms knocking out power lines, to an environmentalist, it may, indeed, be a perfect storm. In the past several years, American power generating companies have been diverted from upgrading their existing equipment, including coal generating plants, transmission lines, substations, etc. on the Grid, by the incessant hounding of the EPA, which has redirected power companies away from upgrades and planned maintenance, and toward - anything but coal. The EPA has induced hundreds of billions of dollars of expenses, and plan even more penalties,fines, and taxes. To me, a penalty levied by the federal government is a fine, and is a tax. Justice Roberts doesn't like "quibbling over labels," but its all the same - mo money demanded by the government. BTW, In the Senate, “Energy policy has been creeping into the tax code [Carbon Tax] at an exponential rate" Senator Orrin Hatch, June 12, 2012. From the East Coast, past Illinois, up to 3 million people have been without electrical power, and so the first suspects to be considered responsible for the catastrophes are, of course, the Environmental Protection Agency and its environmentally ill allies like the Sierra Club, as well as President Obama. Even at this late date, 2,000,000 citizens are without power, including those within Washington, D.C. Bureaucratic slowdowns happily expected. "As utility companies face new deadlines for coal-fired power plants to comply with tight new EPA clean air regulations, many energy suppliers have plans to shutter plants that employ thousands of IBEW members rather than invest in costly upgrades. If thousands of megawatts are suddenly taken off-line, this could trigger massive electricity shortages, just as demand is expected to increase, according to a regional transmission organization report. A report from PJM, a regional transmission organization covering 13 states and the District of Columbia, estimates that 18,000 megawatts of electricity will be lost to the power grid due to expected coal plant shutdowns. That's the loss of enough power to light and heat 18 million homes." It is very difficult to research the direct relationship between this June-July power outage and the powering down/switching/closing of coal fired electric generating plants, because the media is very protective of everything the evironmentalists and Democrats pontificate, and will seldom do stories that give a black eye to the Greens. Even power companies are very beholding and sensitive to the federal government environment czars, and must constantly ingratiate themselves in the presence of Obama's regulatory czars. Even if the recent power outages are more due to storm/mechanical damage to the electric grid, rather than the unavailability of backup power due to decommissioning of generating plants, the fact is, that American power companies have been distracted by the EPA and federal government from upgrading the transmission stations and other infrastructure as they are forced to invest capital into ways of transferring from the traditional (and cheap) coal to other sources such as natural gas. Either way, Obama's big rear is still sitting on American energy production. And, don't think they won't be going after natural gas with a vengeance, as they have attacked oil and nuclear through the years. Here are some alarming charts/graphs of what is planned by the EPA as it robs Americans of its choice to use plentiful coal for energy. 'The Cross-State Air Pollution Rule has received nothing but negative feedback from the affected energy industry, which argues the stricter federal emission law will result in higher costs for electricity and massive loss of U.S. jobs. The plan will also require billions of dollars to retrofit power plants with clean coal technologies. According to a study prepared by the National Economic Research Associates (NERA), the legislation is among the most expensive EPA rules ever imposed on coal-fueled power plants that will cause electric rates to skyrocket by as much as 23 percent and lead to nationwide employment losses totaling 1.4 million job-years by 2020. Power-plant closures are expected to increase in the coming months, as utilities complete their cost analyses of complying with the Cross-State rule, according to Industrial Info Resources. The EPA rule has already forced coal facilities in Ohio, North Carolina, Georgia, and Texas to retire old units, rather than bare the expense of installing pollution-control equipment. 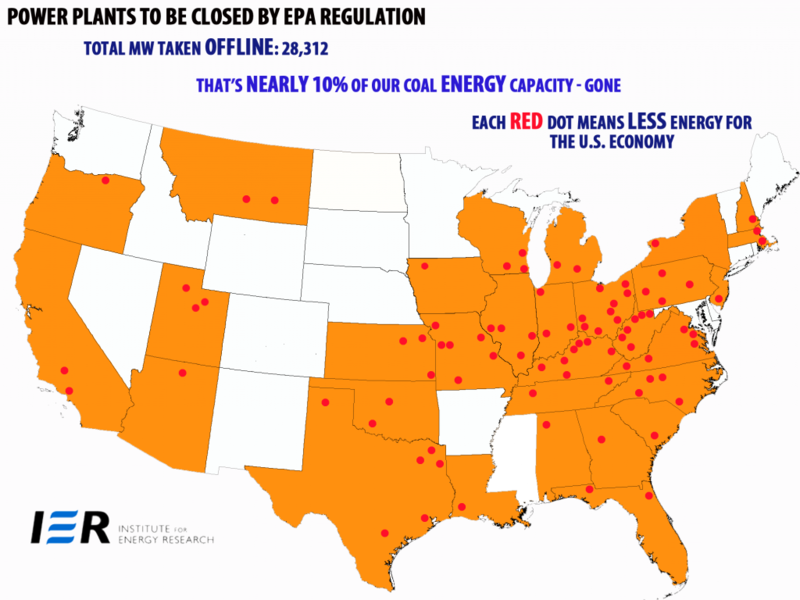 The coal industry maintains that the EPA doesn't seem to care about the economic damage new regulations will cause."